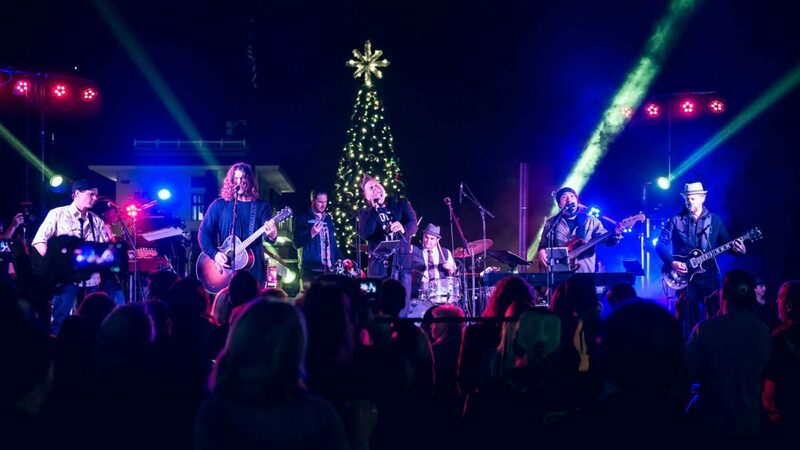 When Jeremy Buck sent out a list of songs in late October to work on for this Saturday’s Hermosa Beach Tree lighting, his fellow musicians on the receiving end reacted with enthusiasm, but also a bit of uncertainty. Co-host Kevin Sousa recalled that the ambition of the setlist inspired a collective “Whoa,” from the baker’s dozen musicians who will be on the stage at the foot of Pier Plaza when the giant evergreen is lit at 6 p.m. But, as the event switches to Saturday for the first time in years, Sousa and Buck said that they sensed an opportunity to reach more people than ever before. The Tree Lighting is the highlight of an all-day event scheduled Saturday, presented by Hermosa’s Chamber of Commerce and Visitors Bureau and intended to kick off the holiday shopping season for the city’s retailers. Restaurants and retailers throughout downtown will feature specials and events throughout the day, as well as a window decorating contest among merchants. Performances by local musicians, including Jamison Jarvis and crossing guard Joe Cipolla, kick off at 3 p.m. on Pier Plaza, where a miniature Santa’s Village will include a carousel for kids to ride. And, along with delivering a boost for local businesses, organizers hope the event will kick-start the giving season, by providing toys and donations for the annual Beach Cities Toy Drive, which provides wrapped toys for charities like Midnight Mission and the South Central Family Health Center. Sousa said that, as he rehearsed for this Saturday, he thought about how for many years Hermosa lacked a signature holiday event in its downtown. Redondo Beach has its annual Holiday Stroll the Thursday after Thanksgiving. And to the north, Manhattan Beach has its Holiday Open House the Wednesday before Thanksgiving, and its fireworks celebration on the second Sunday in December, the latter of which regularly draws more than 5,000 people. Buck began a “Rock for Tots” charity concert 13 years ago, as a gig with fellow musicians inside the Lighthouse Cafe. It gradually expanded and merged with the city’s tree lighting ceremony. “Hermosa has now carved its own identity. It’s segued into this beautiful, communal thing,” Sousa said. “With entertainment going now, there’s really improved attendance. It’s evolved into what’s really going on in the community today,” Tucker said. Buck said that the performance was a rare opportunity for some of the South Bay’s best musicians to get together on the same stage. The variety of playing styles and vocal ranges gathered will allow the group to perform songs that might otherwise be out of reach. While the setlist remained a secret, he said to expect renditions of holiday classics that tug at the heartstrings, and those that make people want to sing along. “We’re pulling from an enormous amount of talent. We kind of come together as a collective and harness others’ talent. And we get to play songs I love, but maybe can’t play on my own,” Buck said.